I have a confession to make: I've never played or run TSR's module B2: Keep on the Borderlands. Yes, I know - this makes me some sort of mutant in the old school; a virtual D&D gamer geek leper. But before you judge me, please allow me to explain. First, the number of kids in my school was not, well, a lot. As any old school gamer will know (and new school gamer might know), the percentage of gamers versus non-gamers in any school population is generally significantly low. To make matters worse, many of us - at least in the days of "D&D leads kids to Satan" - didn't let on that we played these soul-sucking games to other people, making it hard at the best of times to locate fellow gamers. Second, I did not have the luxury as many of my peers did of simply riding my bike to a friend's house. At the age of 15, I think my mother would have had a fit if I'd tried to ride my bike back and forth to/from town. I won't go into the history of how I found my way into the game (we'll save that morsel for a later post), but I basically had three other kids to play the game with, two of whom lived in town. The third, my nephew, lived a few hundred feet down the road. Unfortunately, he was six years my junior, and never ran the game. This left me in a position where I seldom played (as opposed to DM'ed) a game. To make matters worse (yes, they can get worse), I am the type of person who likes to do things my own way. 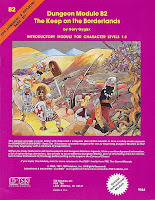 Back in the day, I was not inclined to read through dungeons or adventures written by others. I instead favored creating these myself, as it was much easier for me to run them (due to my deeper understanding of the material). 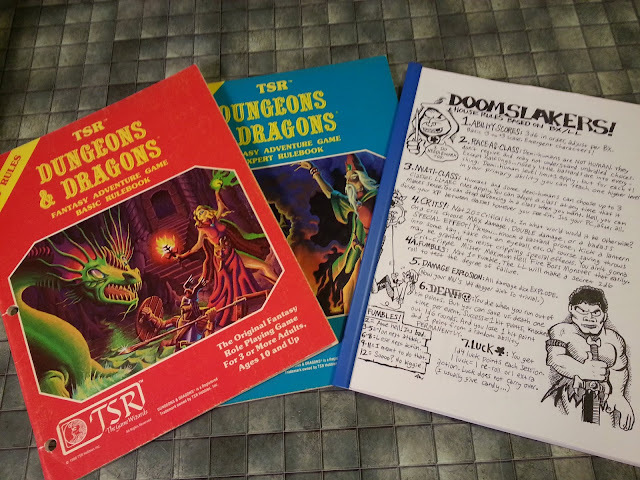 Every year around this time (as it's around the anniversary of my first game) I get the urge to play D&D - especially old school D&D. This year has proved no different. Fortunately, the game - in most of its incarnations (except Hasbro's latest miniatures game that bears the name but not the soul) - is one that my game group seems perfectly willing to fall back into. This is the direction we're taking of late, and I've managed to cajole the other primary game master in the group to take up the dice and run us - at last, huzzah! - through B2, using old school rules (Moldvay/Cook Basic/Expert) with an old school demeanor. I don't know how long the "campaign" will last, but I'm going to dedicate a few posts to relating some of the salient points of our characters' exploits.